The delicious aromas of foods from around the world filled Olshan Lobby on Wednesday afternoon as the Upper Division International Food Festival (IFF), which uses food as a way to showcase the diversity of the student body, returned again this year. 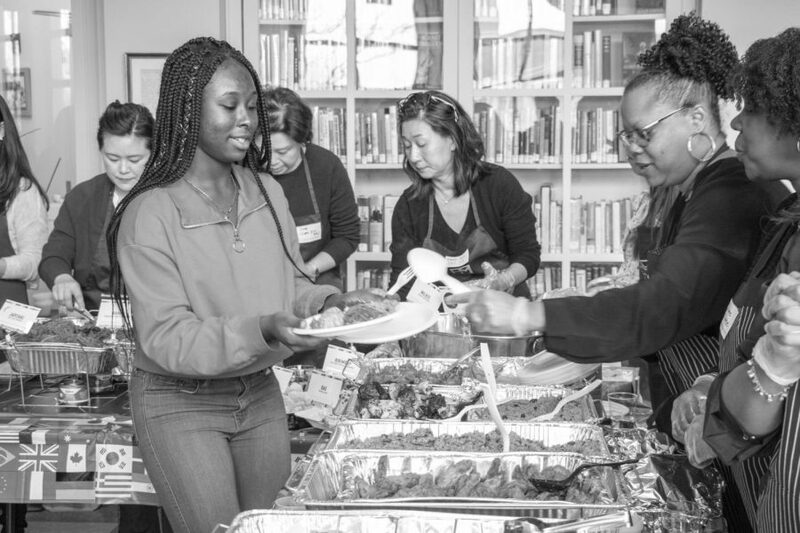 With over 22 types of free food, the food festival gives students an opportunity to branch out from the types of food they normally eat, co-Chair of the IFF Ruzena Goldenberg P’17 P’19 said. Although students supply some of the food, the majority of the work is put in by the school’s alliance groups, Goldenberg said. Parents from the Chinese Family Network, HM South Asian Families, Black Parent’s Union, Korean Parent’s League, and the Hispanic/Latino Family Network all contribute their respective dishes, she said. Co-Choir of the IFF Patti Morris P’20, who will be working at the food festival for the third time this year, believes that “the best part of this event is to see how happy the kids are when they walk into Olshan and see a literal smorgasbord prepared just for them,” she said. In addition to these groups, the festival featured a variety of other cuisines, including Eastern European, Greek, Italian, Indian, Puerto Rican, Moroccan, Jewish, Thai, Haitian, French, Romanian, South American, Turkish, Southern soul food, American food, and Persian food, a culture represented at the IFF for the first time this year, Goldenberg said. While the food festival only lasts one day, the work put into planning the event takes months. The IFF committee begins work on the event in September and October, Goldenberg said. As the festival is entirely parent-run, the committee must find volunteers to run the festival itself and to make enough food to last the entirety of the day. Olshan Lobby featured crowds of students sampling the wide variety of offerings. “The diversity of the food makes us feel comfortable in our own skin,” Amanda Katerei (10) said. “I felt like having my own culture represented in the festival was a good way to share my Filipino experiences with other people,” John Mauro (10) said. Teachers who visited the festival also appreciated the array of dishes. “It was delicious, and there was more variety than ever,” English teacher Rebecca Bahr said. “The takeaway is that we are a diverse community that comes together on this day with our likenesses and differences to learn from and celebrate one another,” Goldenberg said.